With RepairDesk now you can easily send an RMA for a ticket within the ticket section. This will enable you to quickly generate an RMA invoice and send it if the part for the repair job is faulty or is not working properly. Follow these easy steps and easily create an RMA within the ticket section. 1. Make sure that the part has a warranty associated with it. To manage warranty for a part or accessory, go to Inventory >> Manage Inventory >> Mobile, Accessories & Parts, and then select the particular part. Go to the Product Info section and set the Warranty. 2. Then go the particular ticket with the faulty part by going to Repairs >> Manage Tickets, and select the relevant ticket. 3. If the part in the ticket has a warranty associated with it, it will show the option for Warranty Claim. To set the warranty for a part please refers to Step 1. 4. When you click on the warranty claim, a window will open, asking you for a descriptive as well as the generic reason for part replacement. The generic reason usually deals with the condition or status of the part and you can add detailed comments in the descriptive text box. Once you will click on Add to RMA system will two new fields will be shown, showing supplier and RMA status. 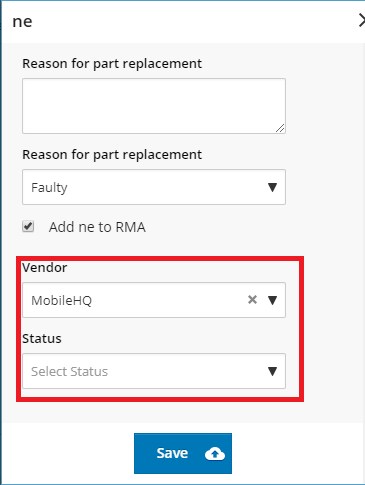 Now you can set the status for RMA right at the time of warranty claim. 5. Once you hit the Save button, your RMA will be generated with selected supplier and Status. Click on View RMA to open RMA and view details. Click on Print Label to print an RMA Label.